From now till Spring there are going to be a lot of places that seem to have a chill in the air and this is just the thing for those occasions. 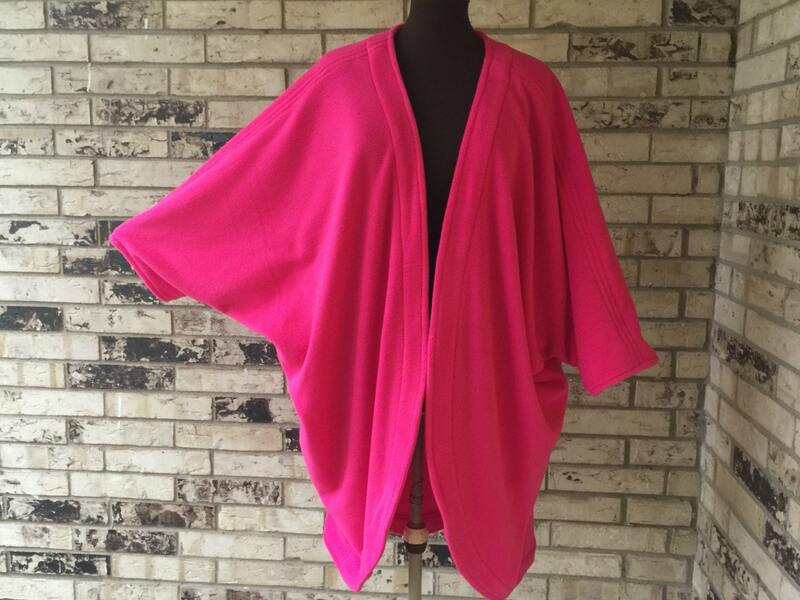 This one is bright fuschia but I can make you one is just about any color you like. Like all fleece it is soft and warm and this wrap is even more comfortable. It's big and roomy....perfect to wear around the house when you need "a little something" across your shoulders. All seams are completely finished to insure that the inside of your garment is as lovely as the outside. It is sized to fit almost everyone up to 5X. We would suggest washing your garment on gentle machine cycle and drying on gentle cycle. Bust/Hips (all around) 80"- 84"
Length in back 38"- 40"
will be priority mail/U S Post Office. Prices listed are for U.S. shipping only - please contact me about International rates. Great quality, great customer service, fast delivery. I do wish I’d asked for pockets on this though. Beautiful fabric and very nicely made, thank you!